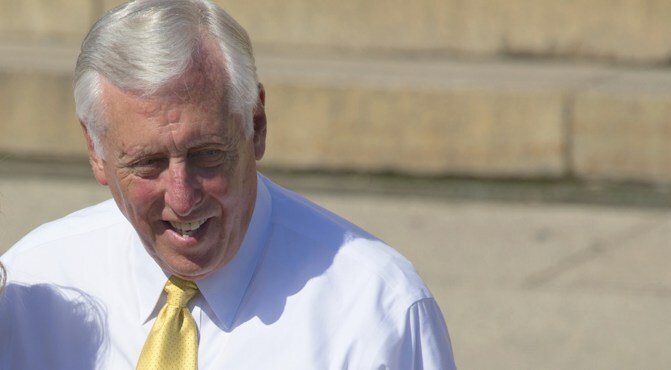 Steny Hoyer: why shouldn’t DC force pro-life Christians to hire pro-aborts? Just in case you were still under the impression that “pro-choice” has anything to do with letting people make choices (despite all evidence to the contrary), House Minority Whip Steny Hoyer is here to clear things up. Well, look, I don’t know specifically what you’re referring to. We’ve been through this with the ACA [Affordable Care Act]. I believe that clearly the ability of people to speak freely is a constitutional guarantee, but I also think freedom of religion is a constitutional guarantee and they need to be balanced, and that’s always a tough thing to do. I’ll leave it at that. Mr. Hoyer supports D.C. autonomy and home rule, and consistent with that support, he defers to the City Council and Mayor in enacting legislation. Ah, I see. So in his view, Uncle Sam shouldn’t meddle in local decision-making. Got it. But what happens when the locality in question isn’t run by pro-aborts and doesn’t have the third-highest abortion rate in the country? Then you get the Freedom of Choice Act of 1993, which would have expressly forbidden states from banning abortion, legislatively codifying Roe v. Wade. And look who was one of the cosponsors: Steny Hoyer! Presumably he would explain all this away by arguing abortion is special because it’s a constitutional right. Even setting aside the fact that it absolutely isn’t, that still begs the question: and pro-life employers’ rights to religion, conscience, and association aren’t?